My friend has this beautiful succulent. She says she has it in this color and green. Can somebody please tell me what plant this is? Hi Mala, this is one of the many Aeonium; they come in many colors, but red, green and yellow or variegated are the most common. Some of them are such a dark red they appear to be black. They love warm and bright conditions; however, they are an odd plant because they go dormant in late summer if it gets really hot; this is a survival trait that helps it to live through the droughts that sometimes happen at this time in their native habitat, in the Canary Islands. They are also unique in that the rosette will elongate into a really tall flower spike, after which that rosette will die. It's important to encourage smaller rosettes to form lower down so you always have a replacement; in many varieties, these will be almost like pups, produced from the roots right at the base of the plant. Other times, they will form all up the stem. Once these get big enough, they can be cut off, allowed to dry overnight to callous the damaged part, and then placed on top of some potting soil, or beside the mother plant right in the garden. They make roots quickly, so you can easily make many more plants. It look like Aeonium 'Cyclops'. 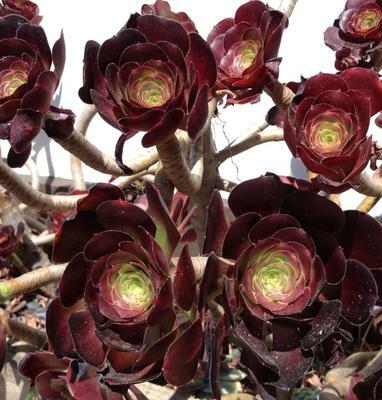 Aeonium change color through out the season as well depending on how much sun or shade it gets. Color tends to be darker with more sun and greener with less sun. Send me some pictures of the damage on the ask the Horticulturist page. Don't start spraying anything until we can identify the culprit! My plant same as this is being eaten by something. I can't see anything on it though. What should I spay it with or what to do.